The first step when using virtual machines is to install the visualization software. In this guide I will show you how to install virtualbox and start a Linux installation. There are many reason why using virtual machines are beneficial. They don’t take any physical space, they consume less power and they are portable. Another technique for running multiple OS is to dual boot where you install two OS on the same drive. This is more risky because if you mess up the installation you might wipe out both of your OS. When talking about virtual machines it can be confusing to understand what OS you mean. I will use the most common terminology: the OS running on your physical machine is a host OS or just host. OS running on a simulated machine (like virtualbox) is called guest OS or just guest. 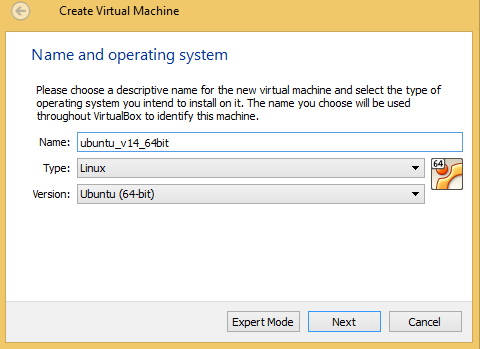 In this guide I will be using virtualbox 5.0. There is also an extensionpack that enable some nice features like USB 2/3. However the license is a bit different so read it carefully before you install it. If you are just going to use virtualbox for private use it shouldn’t be any problem. It won’t be necessary for this guide, but I recommend to install it. It can be found on the same page. Ubuntu is one of the most user friendly Linux distros and because it is very popular there are plenty of good information about basic things online. 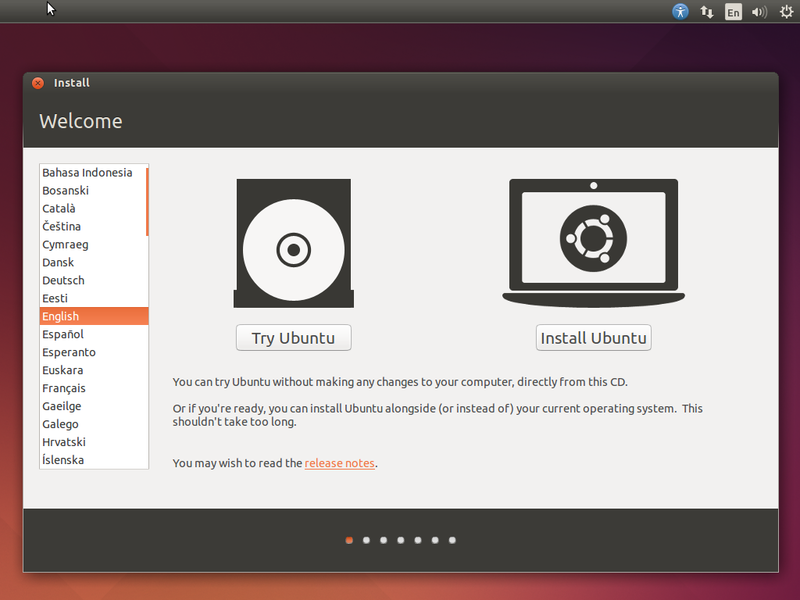 Personally I do not use Ubuntu anymore, it feels bloated and the desktop environment Unity is not my thing. However if you are new to Linux it’s an excellent choice. In this guide I will be using Ubuntu 14.0.2 64 bit version. Press “New” button in virtualbox. Select export mode (it’s really no big difference between guided mode). Type: Often will be automatically filled if you use a proper name. Otherwise select Linux. The only thing to concider here is that the guest will use the host’s memory, so you should not take all the RAM you have. 4 Gig should be enough for most systems. File location: These files can get quite big so save them where you got plenty of space. Moving these files can require some work so chose carefully. File size: 8 Gig is minimum, but that is quite brave. I recommend to select at least 30 gig. If you fill your drive it is difficult and some times impossible to resize the drive so choose carefully. 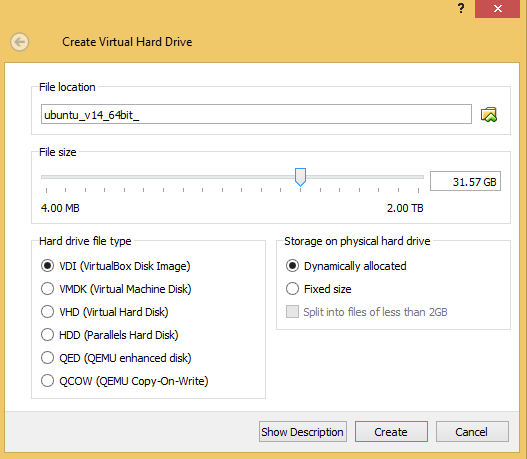 Storage on physical hard disk: Dynamically allocated. This makes the harddrive file grow as you fill it. Selecting this makes it easier to choose a larger size. The only reason to choose Fixed size is if you have an old and slow hard drive. We need to add the installation CD and boot from it and do some performance tweaking. Click advanced. In Shared Clipboard select bidirectional. It will make it possible to copy paste text between host and guest, something that’s really nice when you google. In Boot order uncheck the floppy. Make sure that Optical is checked and the topmost device -since we will boot from a CD. In Processor, select as many as your host got. You should select at least 2 processors. It’s not so important for Ubuntu but some other distros (like CentOS) requires at least 2 processors. Click on the empty CD. To the right there’s another CD icon next to “Optical Drive”. 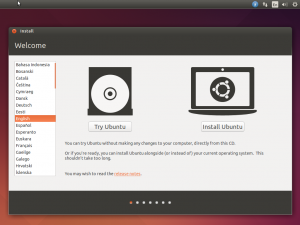 Click on it and select the Ubuntu ISO. Click OK, we’re ready! Start the guest OS and the installation program starts.